If you remember at the beginning of this year I’ve written hat the Taiwanese guys from the company RadiantStar are finally going to start selling the 3Dfier 2D to 3D realtime DirectShow transform filter and they just did that. As previously announced the price for a personal license for the filter is $25 USD and you can order through their website, they are using PayPal as a payment processor so you should not have trouble. You should know that the 3Dfier filter can transform 2D video to stereoscopic 3D in real time with the help of the 3D Vision Stereoscopic Player (version 1.5.2 or newer) or the Stereoscopic Player (version 1.5.4 or above). The filter has been made with the 3D Vision owners in mind although it can work for other stereoscopic 3D setups, but you should have in mind that on such you might not get the same effect. Also be warned that the 2D to 3D video conversion does not provide the same result and is not as good as a true 3D video shot in stereoscopic 3D format. I try 3DFier in combination with NVIDIA 3D Vision Video Player 1.5.2 and the result is perfect. 1080p files are played without a problem and the effect is more remarkable especially in animations movies. I purchased it but got no download link, do they email it? No response yet. Yes, I suppose they should email it to you after the payment is made. stops working after about 15 minutes for me. Anyone else having problems? works great now. So far no time limits. When playing movie the picture is a little bit darker, how can I change the brightness? As for the brightness, you cannot increase it from the filter, you need to resort to other means like for example using additional direchtshow filter that will allow brightness adjustment. Hey Bloody, could you post up an exact guide on how to get this working, at the moment my videos with this thing look like they have been twisted in opposite directions at either edge if you know what i mean? I’m not seeing any real depth at all and was wondering if i somehow managed to screw up the setup? Any help would be appreciated and keep up the good work this blog is awesome. Yes im using 3d vision setup, just actually got a full HD clip up and its alot better than the dvd rip moveis i have, im actually getting some depth with full HD clips, whereas with the dvd rips i can only describe the effect as being like holding a piece of A4 paper landscaped and twisting one side up and one down?????? Strange but ill percivere anyway as this looks very promising with the full HD clips. Thanks again Bloody, Great Blog. Hi all ,I first would like to thank Phillip and Bloody for all the good tips I’ve got. Thanks to them I have a fully functioning 3d system. I never would have found out about the 3dfier filter if it was not for their blogs. I would like to note to anyone reading this blog that the XpanD dlp link X-102 shutter glasses also will work out of the box with the sterecopic player.They are not as stylish as the Nvidia but the quality of the picture is the same with zero ghosting. They also work with tridef software. For Tommy777 I had that problem with my TV tuner hook up and found I had to click format properties to get it to work, don’t know why but it did the trick. And to Radiant Star, thanks for a great product. it’s the best out there so far with especially the TV tuner capability. My anime movies are a little choppy compared to tri-def, but thats minor compared to watching star Trek in near perfect 3D conversion. Hi all ,I forgot to mention I use a Samsung dlp 61A750 Tv and with the stereoscopic player I can adjust the movie or game to full screen size. In fact I would recommene to those who have the spare cash to purchase the stereoscopic player it can do so much more than the Nvidia player. Thanks again. Still Working on it.. Thanks for any Help.. These are streaming the videos online with Flash, right? 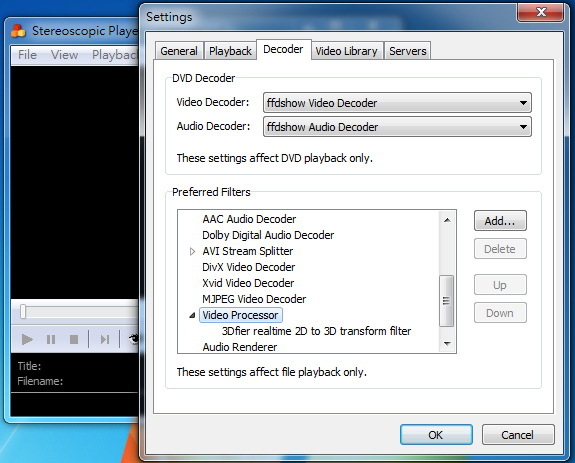 You can probably download them or capture the stream and then play it back through the 3D Vision Stereoscopic Player or through The Stereoscopic Player with the 3Dfier filter loaded in the Video Processors settings. Hi all, Thanks for the tip Phillip, I am now watching sci-fi channel in 3D and am having a blast. Right now I don’t see a need to buy the new 3D Tv’s coming out. Thanks again. with 3dfier or for 3d channels from Real Stereoscopic Side by Side squashed Satellite Boxes like Sky 3d or Directv. Do you have to capture and watch afterwards? or does it convert”on the fly”? ‘Bloody’ responded on another thread to my query, nice one ! Shame that the 3dfier is basically wrapping the divx around a skewed tube but at least I know that that is the way it is supposed to work. hi there…..first of all thx to everyone, so now i can enjoy 3d conversion on my pc……. while im play the tv chanel in avermedia software….it plays normal…..
do i have a wrong setup…..anyone can help me here….. Thanks Tranzadikt :) U the man!